Designers and Artists Note: Direct printing on acrylic changes everything!!! New print graphic technology, and the increase in the use of mediums like clear and even colored acrylic and Plexiglas, does change the design landscape in dramatic ways. One of the ways design is impacted is because clear mediums without background colors, have to be accounted for. And since most direct print technology cannot print white, it can pose a design problem for the medium. It is important to understand the print reproduction capabilities of your printer before designing for applications for clear mediums. Direct print on acrylic, vinyl, and Plexiglas also changes the landscape of the inks that can be used. While most paper based mediums use solvent inks that are absorbed into the mediums, those inks are not appropriate for surfaces where ink cannot be absorbed for adhesion. UV inks have to be used. However, since UV inks sit on top of the medium, this fact adds to the landscape of design because it gives the designer the ability to think about depth for the first time. Ink can be applied in layers to actually raise objects from the surface as a highlight. At DRS we are specialist when it comes to direct print technology. We have the expertise to provide all of the printing techniques discussed and we are right here in Doylestown. 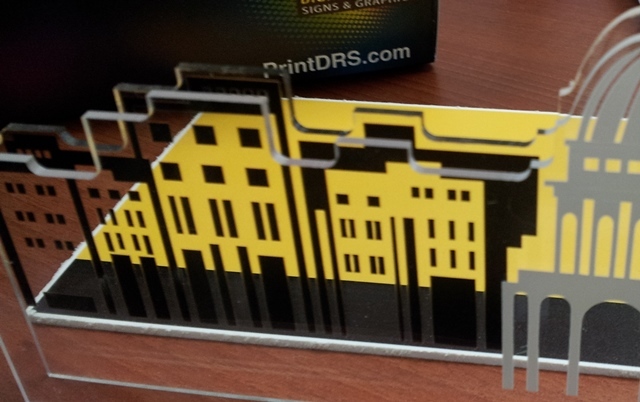 Mike, at DRS, would be happy to show you, in person, how direct printing on acrylic and Plexiglas changes everything that most artists and designers know about designing for this medium.